Easter in Poland After 40 days of Lent comes a week before Good Friday. On Good Friady people don`t eat meat. On Saturday before Easter Sunday people go to church so that the priest can bless eggs, which are in a decorated basket. Eggs are specially decorated, too. They are called "pisanki", "Kroszonki" etc. It depends on the part of Poland. In the basket there also: bread (in memory of Jesus), meat and cureds (they resamble a lamb) and salt (it saves us from sins). Easter eggs symbolize new life. On Saturday people go also to Christ`s tomb. Tradition orders, that Christ`s tomb must be looked after young boys or men. At first Easter was celebrated on the day of Jewish Passover. Now people celebrate Easter on first Sunday after the first full moon in Spring. Celebration begins on Sunday. On Sunday morning there is a procession around the church and the Easter mass. The mass is called Resurrection. After the mess people eat dishes, which were in the blessed basket. There is also a lamb (it symbolize arrivel of Jesus) and pound cakes on Easter table. A new tradition is an Easter bunny. Parents put "bunny" in the garden (there are sweets and small presents) and children search for it. On Easter Monday after mass boys pour water on girls. This tradition comes from antiquity. Our great - grandfathers poured water on fields and on themselves. In this way they woke up The Earth Mother`. Nowadays this holiday is a fun, which is called Smingus dyngus`. For some people (especially for young girls) this habit is very tiring. 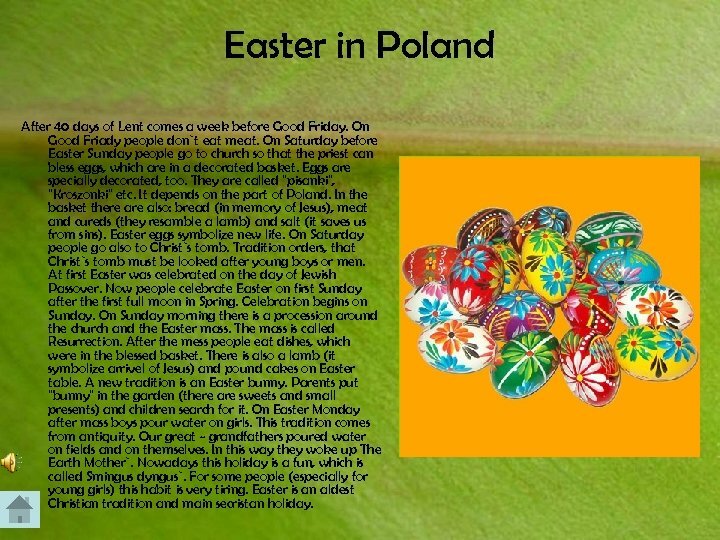 Easter is an aldest Christian tradition and main secristan holiday. 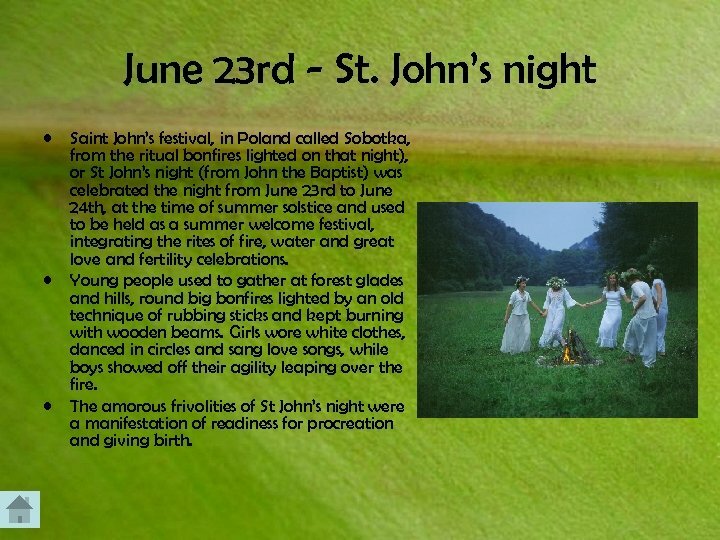 June 23 rd - St. John’s night • • • Saint John’s festival, in Poland called Sobotka, from the ritual bonfires lighted on that night), or St John’s night (from John the Baptist) was celebrated the night from June 23 rd to June 24 th, at the time of summer solstice and used to be held as a summer welcome festival, integrating the rites of fire, water and great love and fertility celebrations. Young people used to gather at forest glades and hills, round big bonfires lighted by an old technique of rubbing sticks and kept burning with wooden beams. Girls wore white clothes, danced in circles and sang love songs, while boys showed off their agility leaping over the fire. The amorous frivolities of St John’s night were a manifestation of readiness for procreation and giving birth. 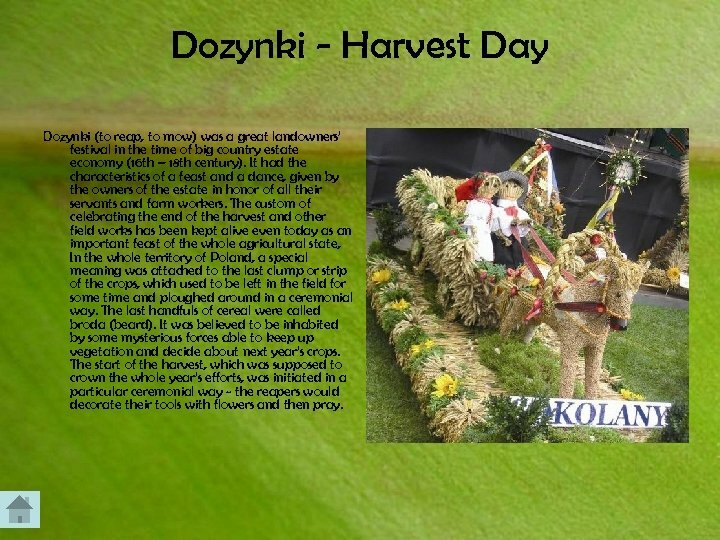 Dozynki - Harvest Day Dozynki (to reap, to mow) was a great landowners’ festival in the time of big country estate economy (16 th – 18 th century). It had the characteristics of a feast and a dance, given by the owners of the estate in honor of all their servants and farm workers. The custom of celebrating the end of the harvest and other field works has been kept alive even today as an important feast of the whole agricultural state, In the whole territory of Poland, a special meaning was attached to the last clump or strip of the crops, which used to be left in the field for some time and ploughed around in a ceremonial way. The last handfuls of cereal were called broda (beard). It was believed to be inhabited by some mysterious forces able to keep up vegetation and decide about next year’s crops. The start of the harvest, which was supposed to crown the whole year’s efforts, was initiated in a particular ceremonial way - the reapers would decorate their tools with flowers and then pray. 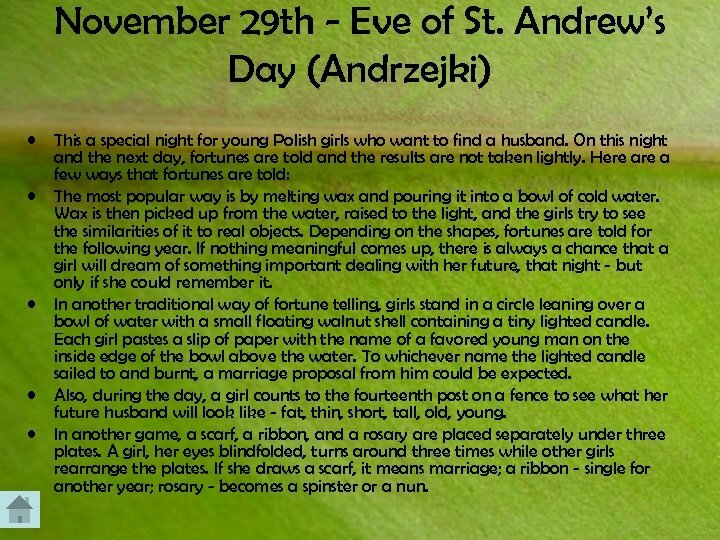 November 29 th - Eve of St. Andrew’s Day (Andrzejki) • • • This a special night for young Polish girls who want to find a husband. On this night and the next day, fortunes are told and the results are not taken lightly. Here a few ways that fortunes are told: The most popular way is by melting wax and pouring it into a bowl of cold water. Wax is then picked up from the water, raised to the light, and the girls try to see the similarities of it to real objects. Depending on the shapes, fortunes are told for the following year. If nothing meaningful comes up, there is always a chance that a girl will dream of something important dealing with her future, that night - but only if she could remember it. In another traditional way of fortune telling, girls stand in a circle leaning over a bowl of water with a small floating walnut shell containing a tiny lighted candle. Each girl pastes a slip of paper with the name of a favored young man on the inside edge of the bowl above the water. To whichever name the lighted candle sailed to and burnt, a marriage proposal from him could be expected. Also, during the day, a girl counts to the fourteenth post on a fence to see what her future husband will look like - fat, thin, short, tall, old, young. In another game, a scarf, a ribbon, and a rosary are placed separately under three plates. A girl, her eyes blindfolded, turns around three times while other girls rearrange the plates. If she draws a scarf, it means marriage; a ribbon - single for another year; rosary - becomes a spinster or a nun. 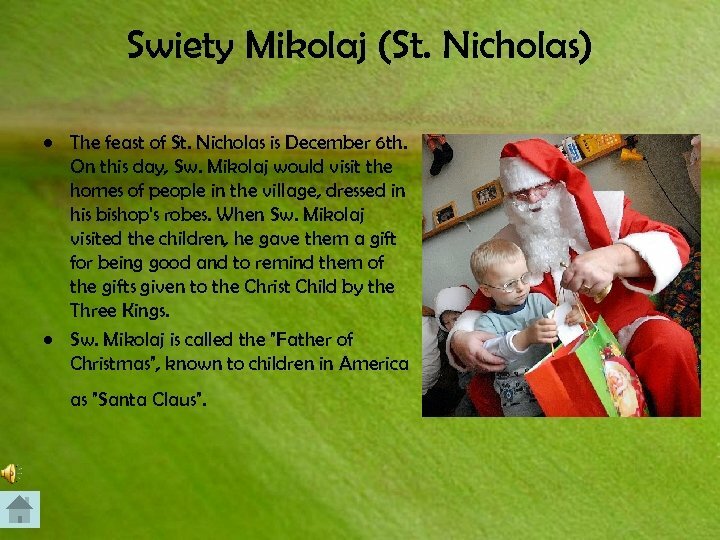 Swiety Mikolaj (St. Nicholas) • The feast of St. Nicholas is December 6 th. On this day, Sw. Mikolaj would visit the homes of people in the village, dressed in his bishop's robes. When Sw. Mikolaj visited the children, he gave them a gift for being good and to remind them of the gifts given to the Christ Child by the Three Kings. • Sw. Mikolaj is called the "Father of Christmas", known to children in America as "Santa Claus". „Kulig” • • There were a lot of festivity during the carnival in Poland feasts, balls, weddings, masquerades and hunting. One of the colorful customs during this time is a festivity called Kulig. It originated with the gentry, but was practiced to different degrees by most of the population. The closest neighbors arranged the sleigh ride at night, visiting other homes. The suprised host had to receive the unexpected guests with everything in the cellar and pantry, after which he joined the party, which set out for the next house. 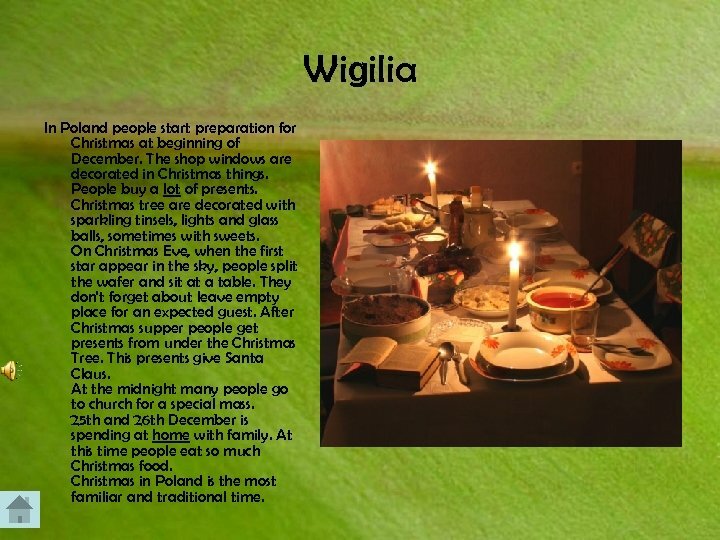 Wigilia In Poland people start preparation for Christmas at beginning of December. The shop windows are decorated in Christmas things. People buy a lot of presents. Christmas tree are decorated with sparkling tinsels, lights and glass balls, sometimes with sweets. On Christmas Eve, when the first star appear in the sky, people split the wafer and sit at a table. They don't forget about leave empty place for an expected guest. After Christmas supper people get presents from under the Christmas Tree. This presents give Santa Claus. At the midnight many people go to church for a special mass. 25 th and 26 th December is spending at home with family. At this time people eat so much Christmas food. 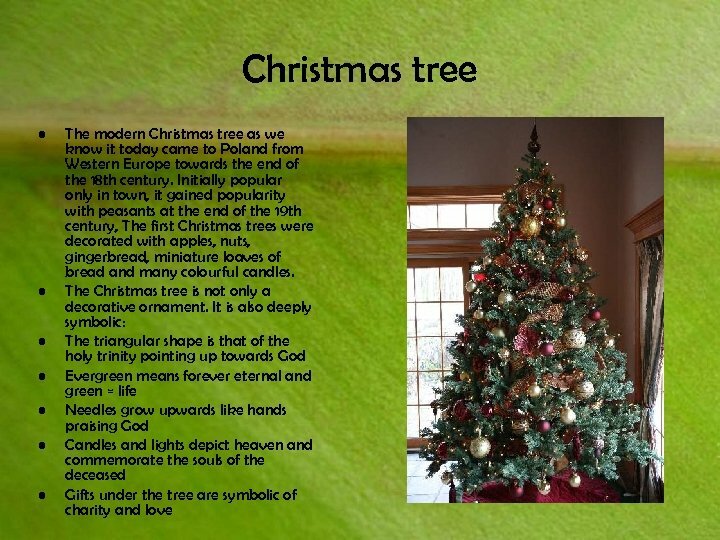 Christmas in Poland is the most familiar and traditional time. 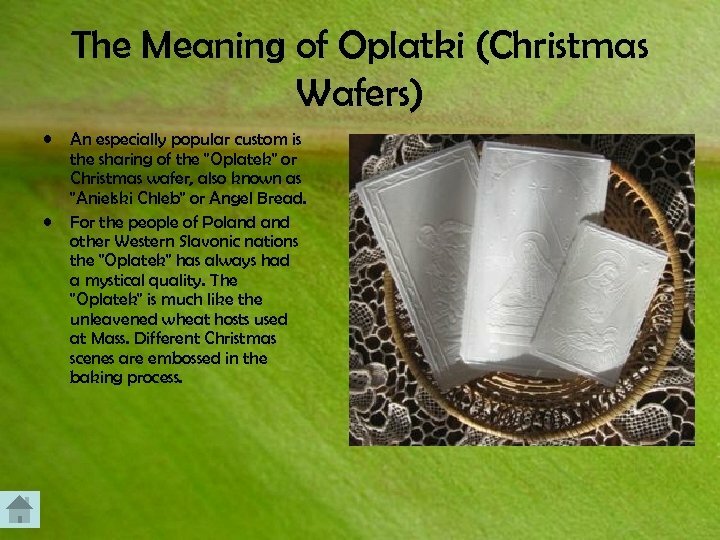 The Meaning of Oplatki (Christmas Wafers) • • An especially popular custom is the sharing of the "Oplatek" or Christmas wafer, also known as "Anielski Chleb" or Angel Bread. For the people of Poland other Western Slavonic nations the "Oplatek" has always had a mystical quality. The "Oplatek" is much like the unleavened wheat hosts used at Mass. Different Christmas scenes are embossed in the baking process. 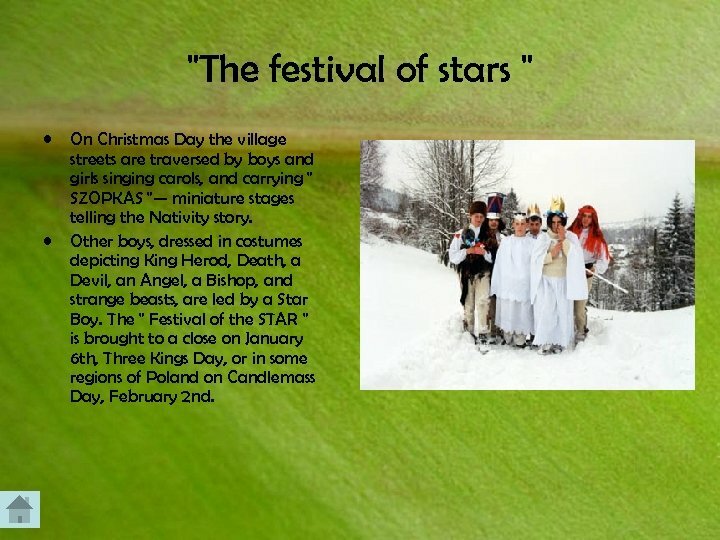 "The festival of stars " • • On Christmas Day the village streets are traversed by boys and girls singing carols, and carrying " SZOPKAS "— miniature stages telling the Nativity story. Other boys, dressed in costumes depicting King Herod, Death, a Devil, an Angel, a Bishop, and strange beasts, are led by a Star Boy. The " Festival of the STAR " is brought to a close on January 6 th, Three Kings Day, or in some regions of Poland on Candlemass Day, February 2 nd. 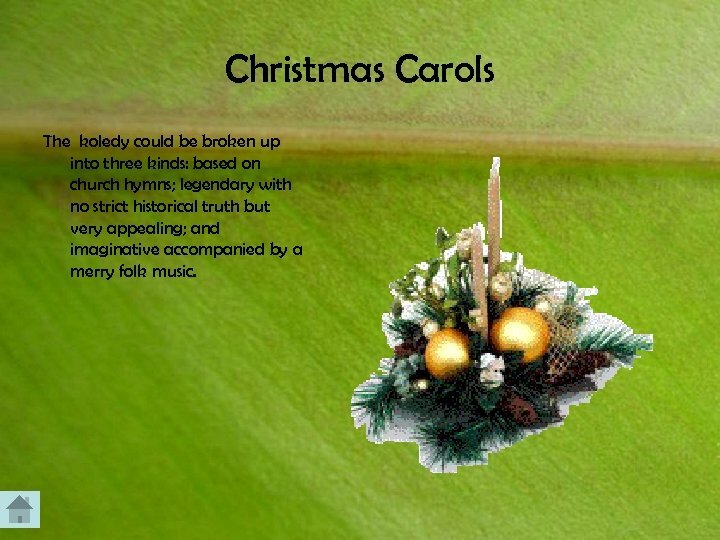 Christmas Carols The koledy could be broken up into three kinds: based on church hymns; legendary with no strict historical truth but very appealing; and imaginative accompanied by a merry folk music. 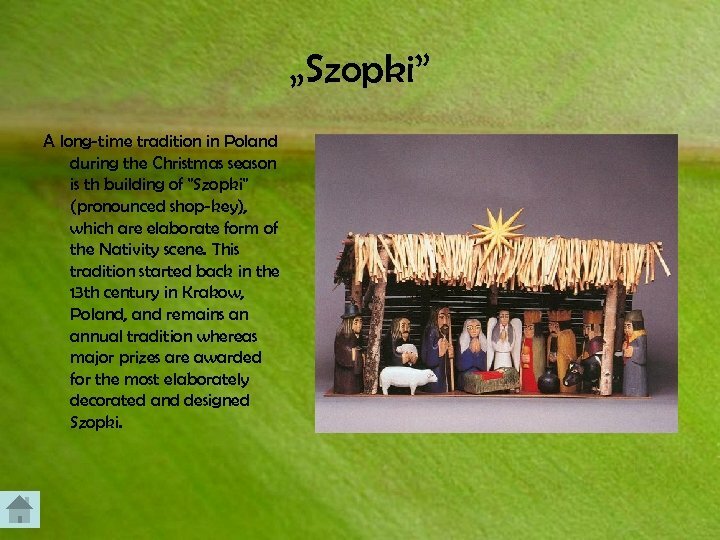 „Szopki” A long-time tradition in Poland during the Christmas season is th building of "Szopki" (pronounced shop-key), which are elaborate form of the Nativity scene. This tradition started back in the 13 th century in Krakow, Poland, and remains an annual tradition whereas major prizes are awarded for the most elaborately decorated and designed Szopki. 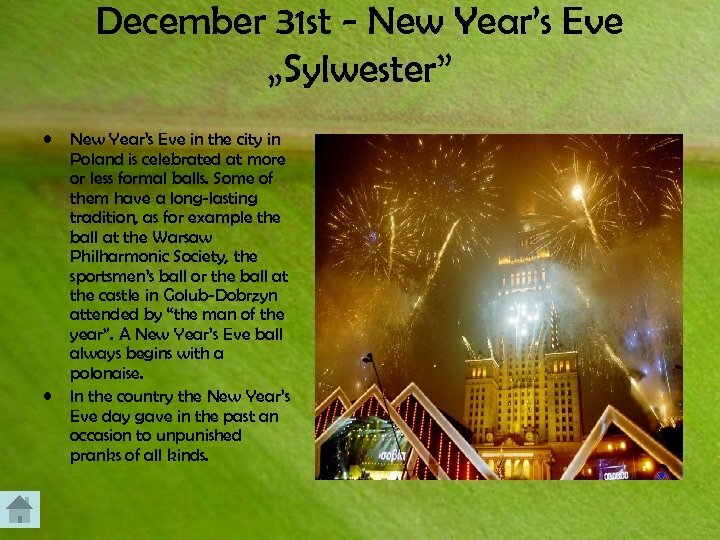 December 31 st - New Year’s Eve „Sylwester” • • New Year’s Eve in the city in Poland is celebrated at more or less formal balls. Some of them have a long-lasting tradition, as for example the ball at the Warsaw Philharmonic Society, the sportsmen’s ball or the ball at the castle in Golub-Dobrzyn attended by “the man of the year”. A New Year’s Eve ball always begins with a polonaise. In the country the New Year’s Eve day gave in the past an occasion to unpunished pranks of all kinds.